Director in attendance Friday, Monday, Tuesday! Nan Goldin collaborator Valerie Massadian’s directorial debut stars a four year old. “There's not one word, one gesture—nothing—that I imposed on her. We played,” she told Craig Hubert of Interview Magazine. 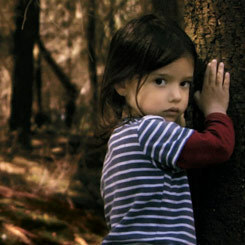 Toddler actor Kelyna Lecomte plays Nana, a girl abandoned by her mother on the outskirts of her grandfather’s pig farm. Filmed with a voyeuristic distance, Nana unfolds in the allowed space as the character’s isolation endows her own developing independence. Audiences are given an innocently intimate, contemplative glimpse of the world as Nana views it. Played with extraordinary composure, the character of Nana is a quiet delight to watch. Winner of the Best First Film prize at the Locarno Film Festival, this is a sweet, life-affirming faux-fairytale, simultaneously enchanting and elegiac. >> Want to learn more about the process of making Nana? Director Valerie Massadian hosts an afternoon class at the Film Forum on January 12.